The right to keep and bear arms was outlined as a basic American right over two centuries ago. Because of that, the U.S. is a focal point for gun sales and manufacturing. But just how many firearms have been made in the U.S.? Who exports to the U.S. and imports from the U.S.? How many people are federally licensed to transfer and manufacture firearms? There is an endless stream of questions on this topic, but there's public record data that sheds light on a few of them. To view all the aggregated data for firearms commerce topics according to recent reports from the U.S. Bureau of Alcohol, Tobacco, Firearms and Explosives, click on each listed topic item to jump to its brief analysis. How Many Guns Are Annually Manufactured In The U.S.? A lot — 134,284,120 guns were manufactured in the U.S. from 1986 to 2014, at an average of 4,630,487 per year with a peak of 10,844,792 in 2013, based on data released by the ATF. That's including pistols, revolvers, rifles, shotguns and miscellaneous firearms. One year sticks out in all available data: 2013. Click the image to make it bigger! 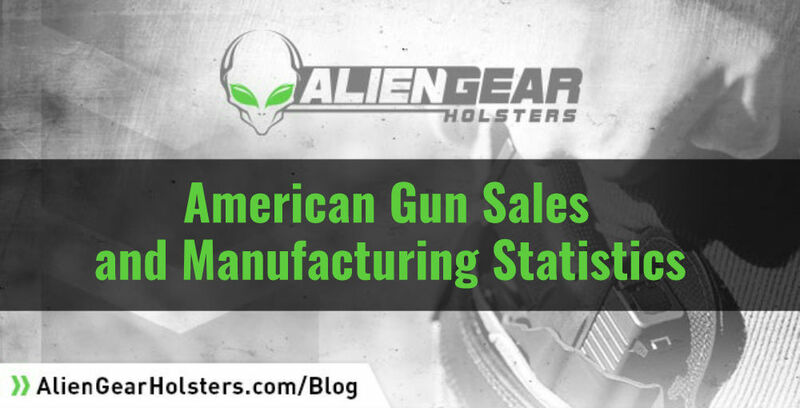 It ranked the highest production numbers for pistols, rifles and miscellaneous firearms; the second highest production numbers for shotguns; and the fourth highest production numbers for revolvers. Why were there so many firearms made that year? The influx in manufacturing may be attributed to sociocultural, political, criminal and economic factors, but Smith & Wesson's 2014 annual corporate report reflects their official viewpoint. Their net sales in 2013 hit a record $587.5 million. "... we experienced strong consumer demand for our firearm products following a new administration taking office in Washington, D.C. in 2009. In addition, speculation surrounding increased gun control at the federal, state, and local level and heightened fears of terrorism and crime can affect consumer demand for our products. Currently, federal and several states’ legislatures are considering additional legislation relating to the regulation of firearms. These proposed bills are extremely varied, but many seek either to restrict the makeup of a firearm, including restrictions on magazine capacity, or ban the sale and, in some cases, the ownership of various types of firearms," according to the report, which can be downloaded here. 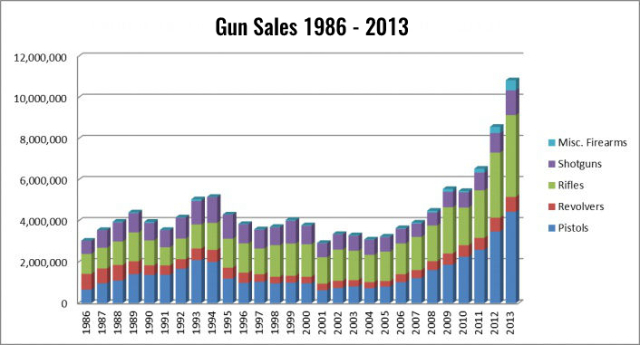 Firearms sales spike in the aftermath of mass shootings. A study published in 2017 on firearm acquisitions in California found that in the wake of the Newtown and San Bernardino shootings, there was a 53 percent and 41 percent increase, respectively, over expected sales volume in the state. And following the San Bernardino shootings, acquisition rates increased by 85 percent from residents of that city and adjacent neighborhoods. The amount of firearms made in the U.S. overshadows the amount of U.S. firearms imports, but how many are shipped abroad? Exports and Imports Annually by the U.S.
From 1986 to 2014, there were 8,089,691 firearms exported at an annual average of 278,955, with a peak of 431,204 in 1993. Over that 30-year period, handguns obviously show the highest increase in imports, from 231,000 in 1986 to 2,470,101 in 2015. 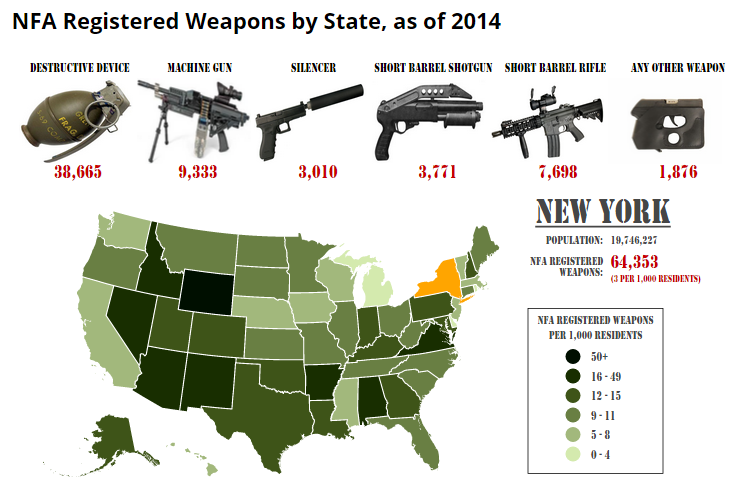 If 2013 was such a significant year for firearms imported, where did they come from? Where Are Firearms Imported From? The number of firearms imported, and from where, shifts on a year-to-year basis depending on variable factors like foreign investment in the American market and American military firearms contracts, but let's take a look at 2013's import data by manufacturing country, according to the 2014 Firearms Commerce in the United States Annual Statistical Update report from the ATF. About 63 percent of firearms imported in 2015 were handguns, which is slightly higher than 2013, which was at 56 percent. The National Firearms Act also affects annual gun sales and transactions in a large way through taxation and registration. Gun sales for qualifying purchases and transactions under the National Firearms Act generate federal tax revenue. But what companies are required to pay taxes? Well, according to ATF Form 5630.7, "importers, manufacturers and dealers of firearms subject to the National Firearms Acts are individuals or business entities who import, manufacture or deal in machineguns, short-barreled shotguns and rifles, destructive devices," and other qualifying firearms defined under 26 U.S.C. 5845. 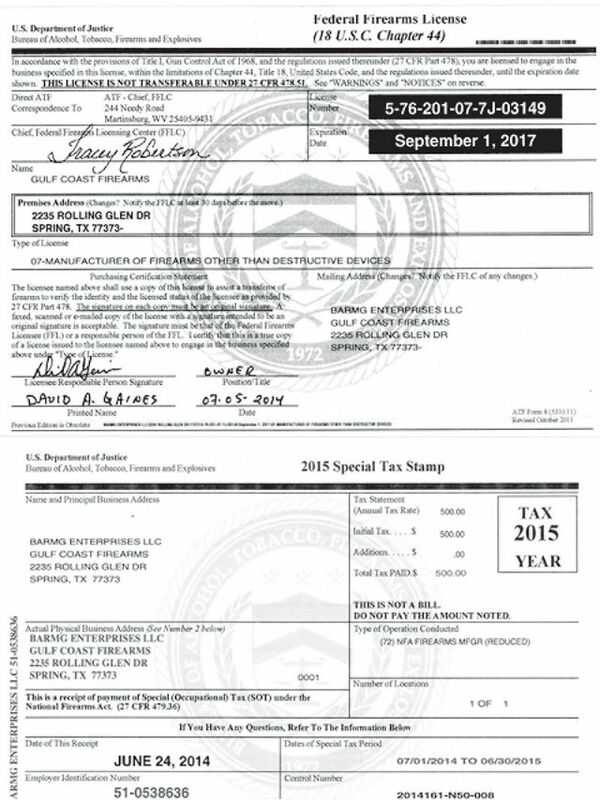 The following taxes are generated only from firearms classified under that definition, not conventional or sporting-type firearms. There are two types of tax records that are publically recorded in ATF reports: occupational taxes and transfer/making tax paid. From 1984 to 2015, there was about $60,551,000 in tax revenue generated from occupational taxes, but as per 26 U.S.C. 5851 that tax is waived for businesses that are exclusively dealing with a U.S. agency. The highest year on record is 2015 at $5,417,000. There is a required tax on NFA firearms ($200 each) when transferred, and when each is made ($200 per). From 1984 to 2015, there was $163,187,000 generated in total from those two categories, with $32,462,000 generated in 2015 alone. 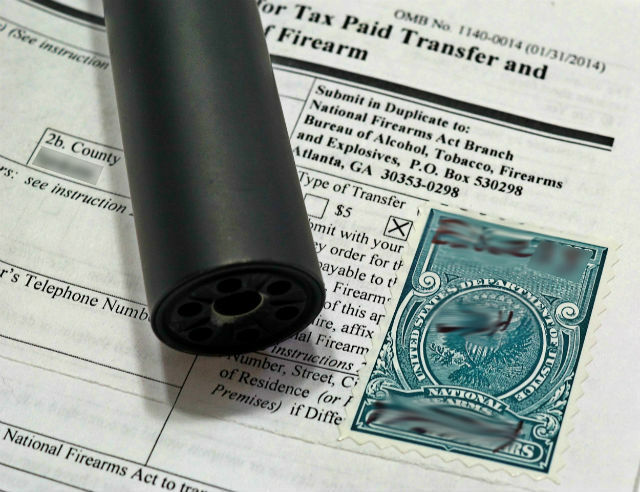 Transfer taxes are not required when NFA firearms are sent to U.S., state or local governments. Pennsylvania: a total of 222,722, with 12,835 short barreled shotguns; 7,779 short barreled rifles; 29,742 silencers; 17,989 machineguns; 152,262 destructive devices and 2,115 other weapons. There is a large amount of "destructive devices" made in each state because it's more or less a catch-all term for what's defined under 26 U.S. Code § 5845 (f) — including explosive, incendiary or poison gas bombs, grenades, rockets with a propellant charge of more than four ounces, missiles with an explosive or incendiary charge of more than one-quarter ounce. Destructive devices are also "2) any type of weapon by whatever name known which will, or which may be readily converted to, expel a projectile by the action of an explosive or other propellant, the barrel or barrels of which have a bore of more than one-half inch in diameter, except a shotgun or shotgun shell which the Secretary finds is generally recognized as particularly suitable for sporting purposes; and (3) any combination of parts either designed or intended for use in converting any device into a destructive device as defined in subparagraphs (1) and (2) and from which a destructive device may be readily assembled." Aside from the number of firearms manufactured and sold, how many people are Federal Firearms Licensees, and which states boast the most? Federal Firearms Licensees in the U.S. There were 139,840 Federal Firearms Licensees in the U.S. in 2015 — the latest year this information is listed in public record. About 79,000 of those FFLs were licensed business entities, with about 11 percent inspected for compliance. However, 1988 is the highest year on record with 272,953 total FFLs, 239,637 of which were licensed dealers. Terror Watchlist: Does It Affect Gun Sales and Background Checks? What's the Difference Between a Home Defense and Concealed Carry Gun?